Supervisory Control Data Acquisition Purpose of SCADA? 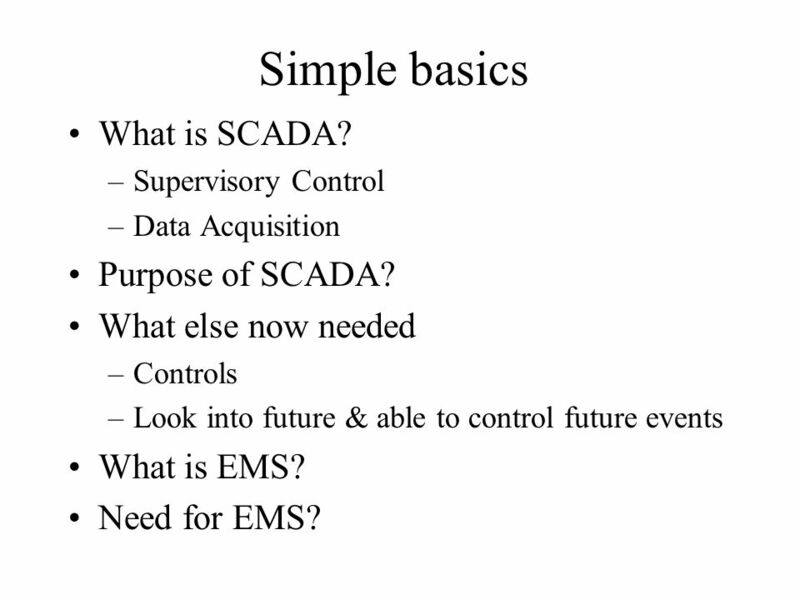 What else now needed Controls Look into future & able to control future events What is EMS? Need for EMS? 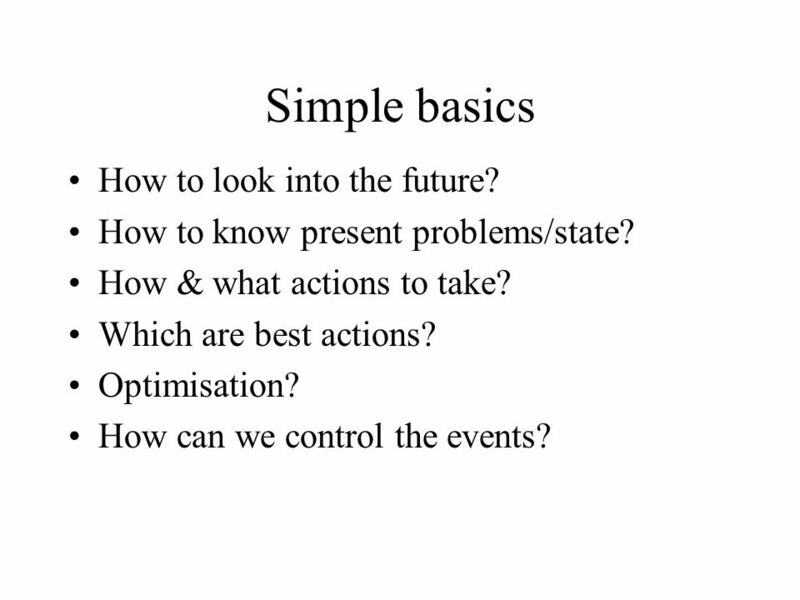 3 Simple basics How to look into the future? 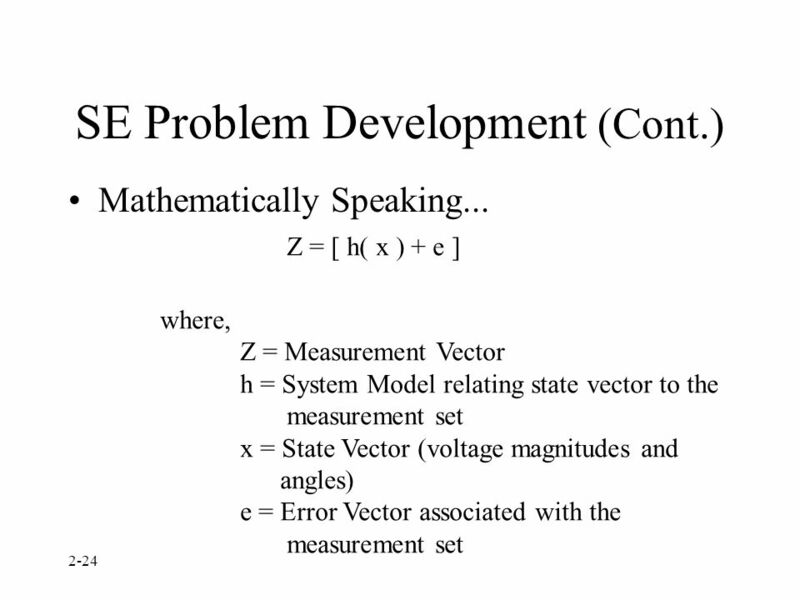 How to know present problems/state? How & what actions to take? Which are best actions? Optimisation? How can we control the events? 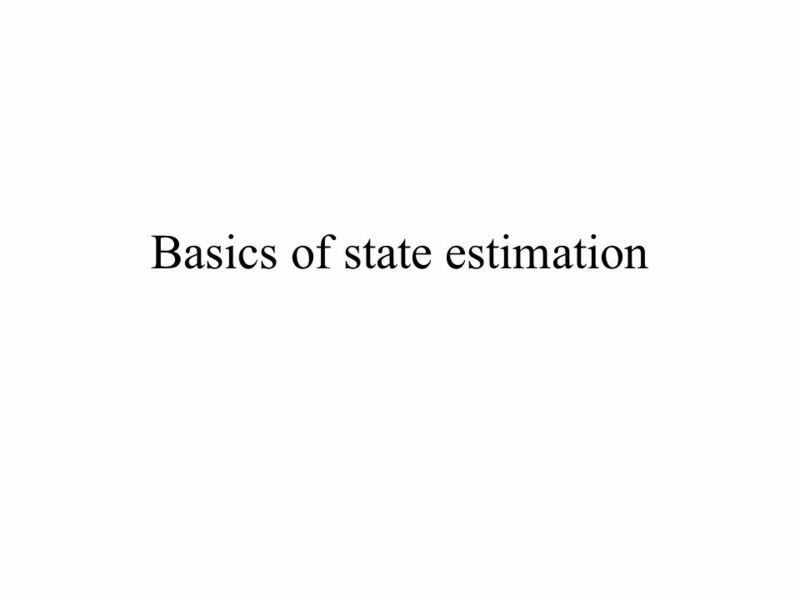 4 Simple basics What is State Estimation (SE)? Why is it required? How is it achieved? Techniques? Process? A robust Energy Management System capable of meeting the requirements of changed scenarios of deregulated market mechanisms. 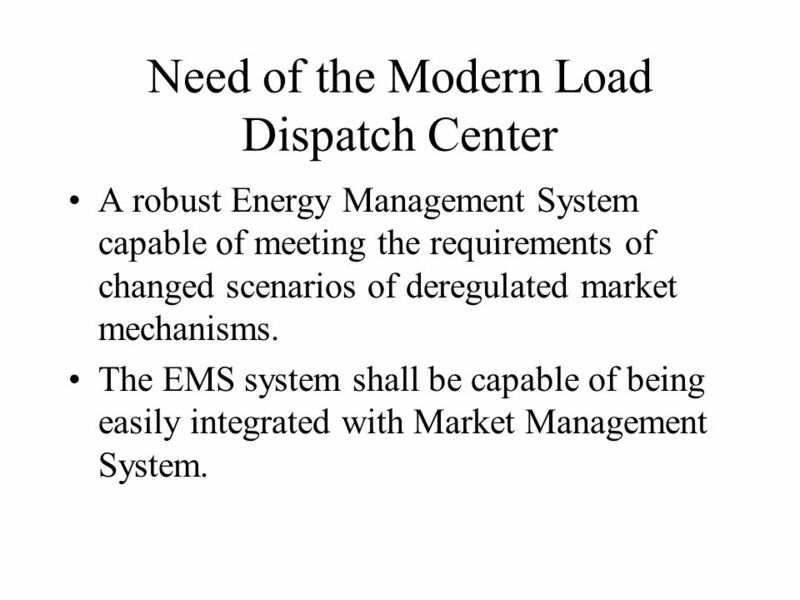 The EMS system shall be capable of being easily integrated with Market Management System. 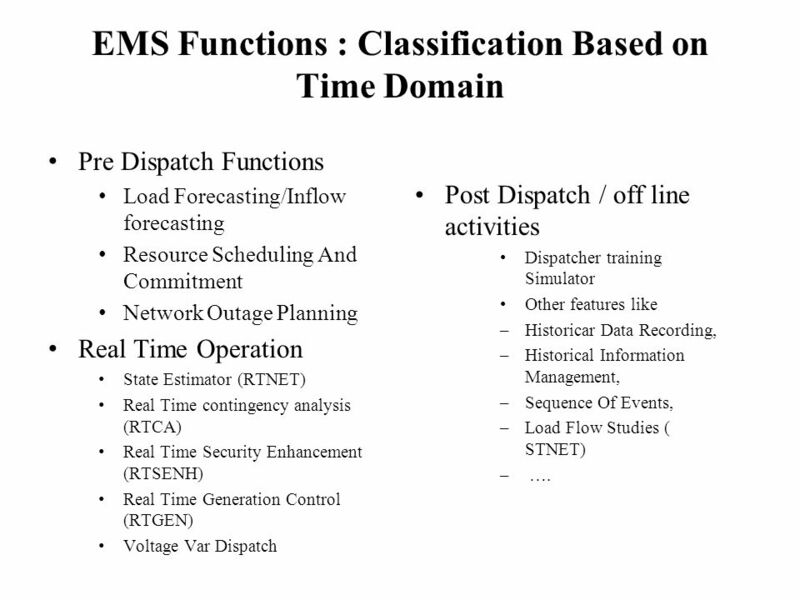 6 Requirement of EMS Functions. 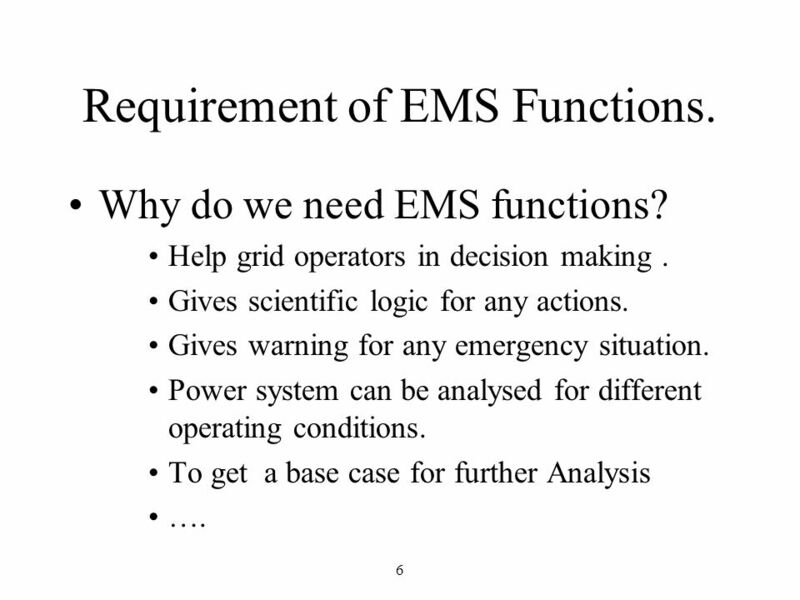 Why do we need EMS functions? Help grid operators in decision making . Gives scientific logic for any actions. Gives warning for any emergency situation. Power system can be analysed for different operating conditions. 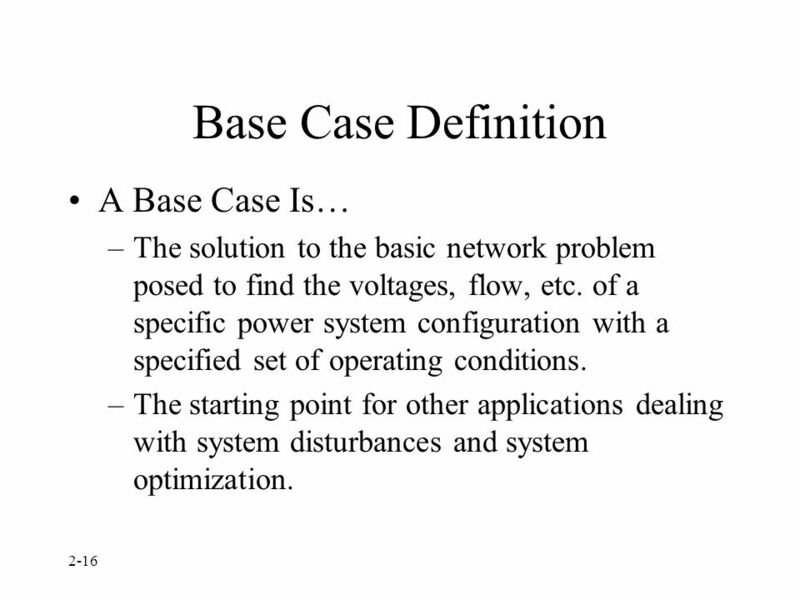 To get a base case for further Analysis …. Pre Dispatch Functions Load Forecasting/Inflow forecasting Resource Scheduling And Commitment Network Outage Planning Real Time Operation State Estimator (RTNET) Real Time contingency analysis (RTCA) Real Time Security Enhancement (RTSENH) Real Time Generation Control (RTGEN) Voltage Var Dispatch Post Dispatch / off line activities Dispatcher training Simulator Other features like Historicar Data Recording, Historical Information Management, Sequence Of Events, Load Flow Studies ( STNET) …. What’s A State? The complete “solution” of the power system is known if all voltages and angles are identified at each bus. 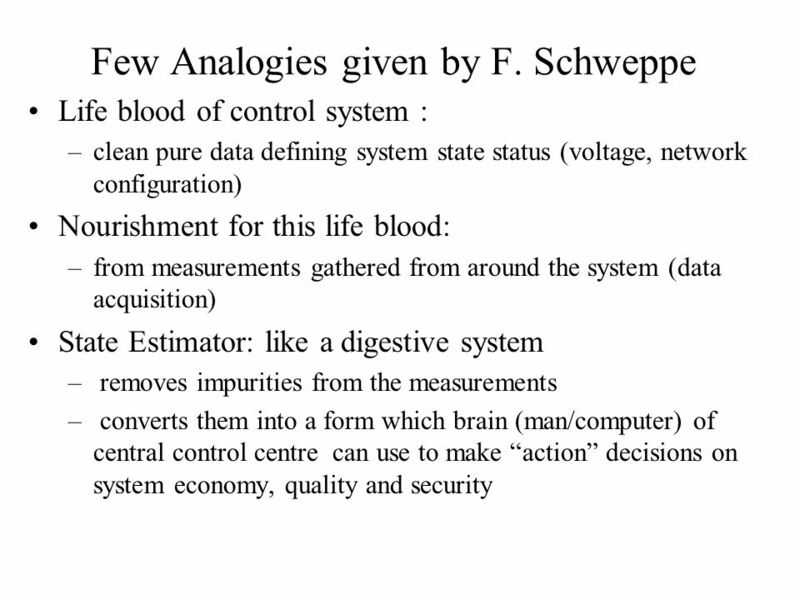 These quantities are the “state variables” of the system. Why Estimate? Meters aren’t perfect. Meters aren’t everywhere. Very few phase measurements? SE suppresses bad measurements and uses the measurement set to the fullest extent. 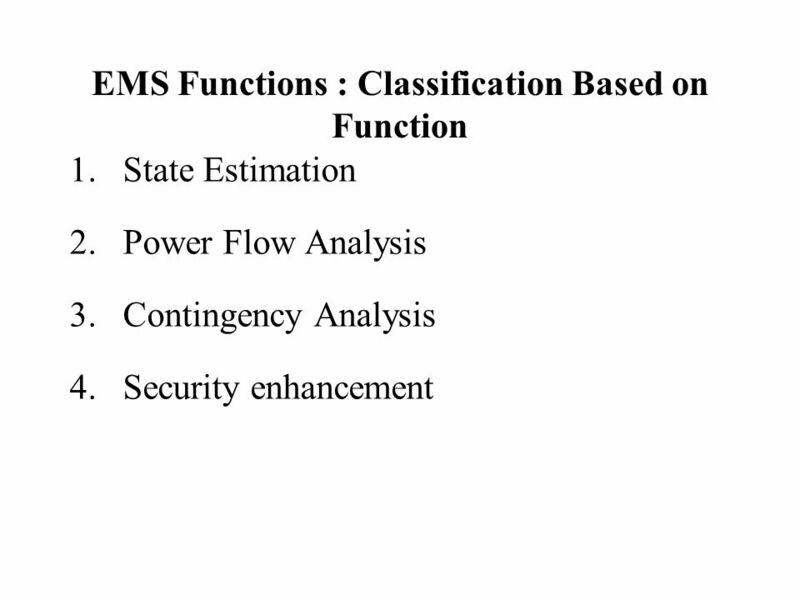 12 EMS Functions Out of the all EMS functions State Estimator is the first and most important function. 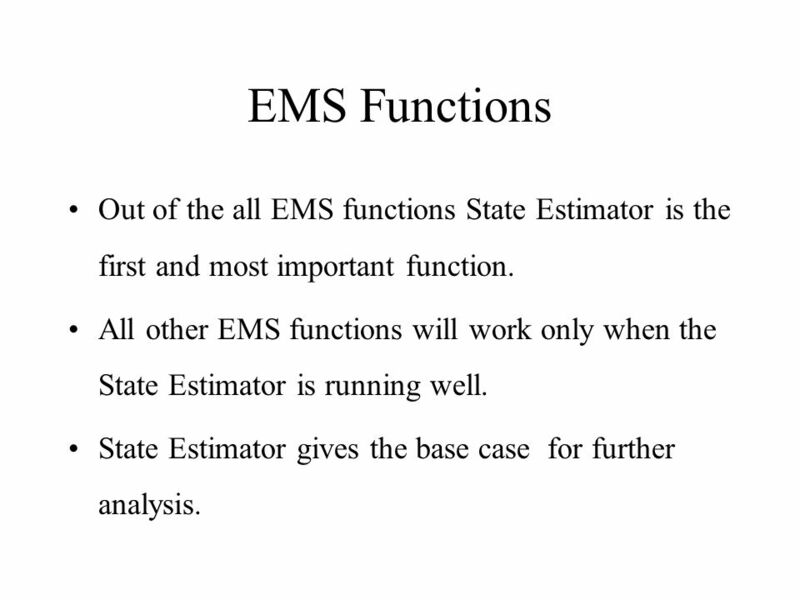 All other EMS functions will work only when the State Estimator is running well. 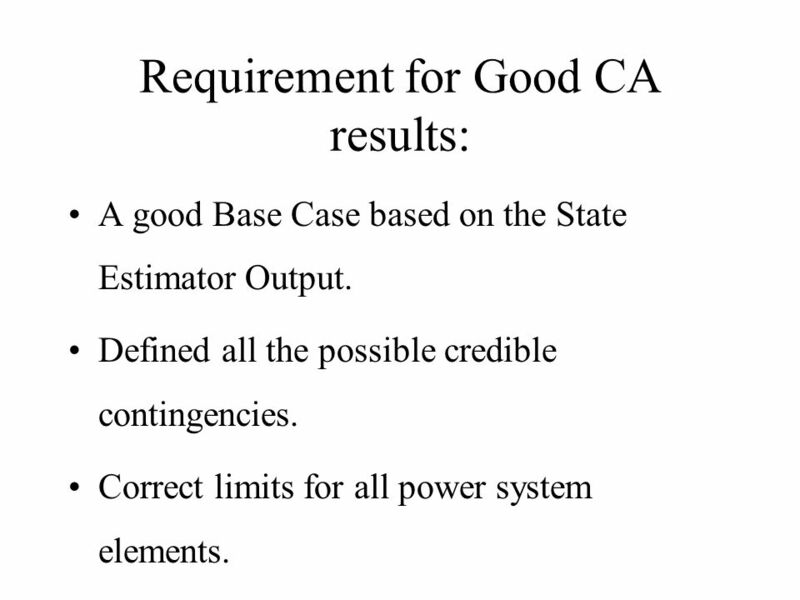 State Estimator gives the base case for further analysis. 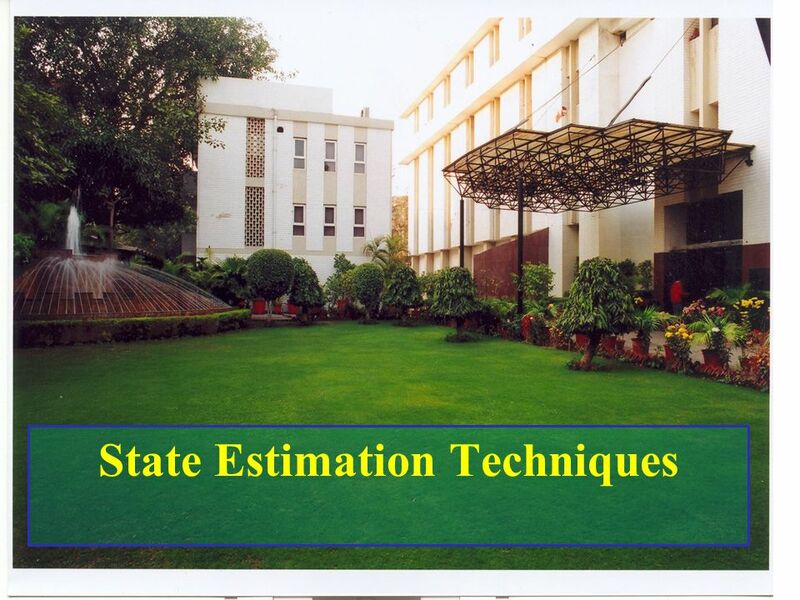 13 State Estimation State Estimation is the process of assigning a value to an unknown system state variable based on measurements from that system according to some criteria. The process involves imperfect measurements that are redundant and the process of estimating the system states is based on a statistical criterion that estimates the true value of the state variables to minimize or maximize the selected criterion. 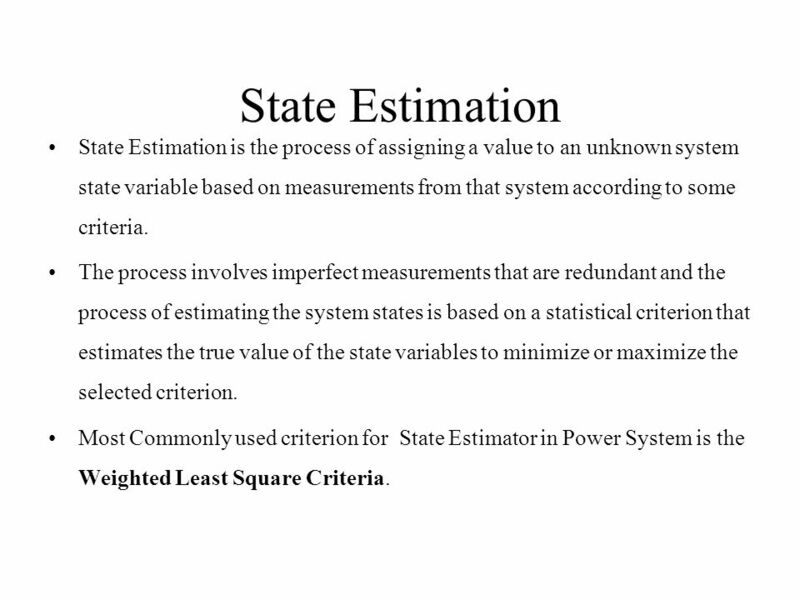 Most Commonly used criterion for State Estimator in Power System is the Weighted Least Square Criteria. 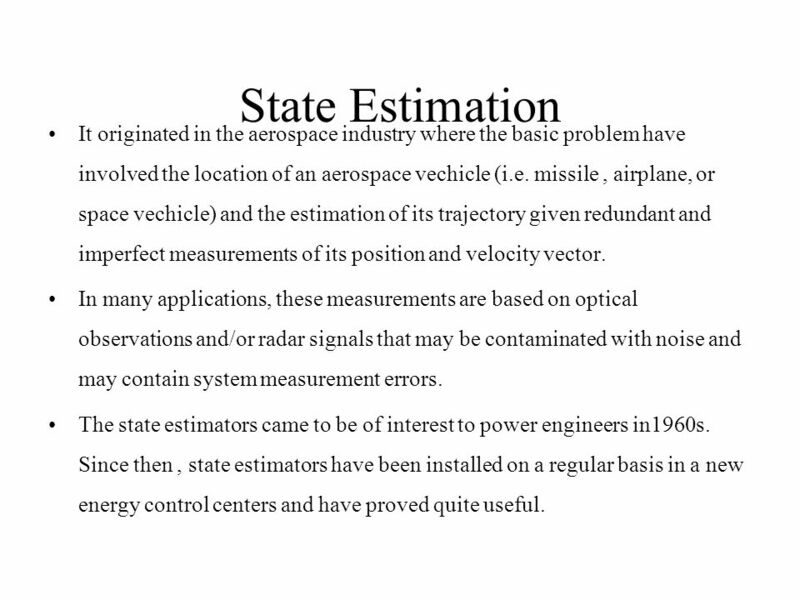 14 State Estimation It originated in the aerospace industry where the basic problem have involved the location of an aerospace vechicle (i.e. 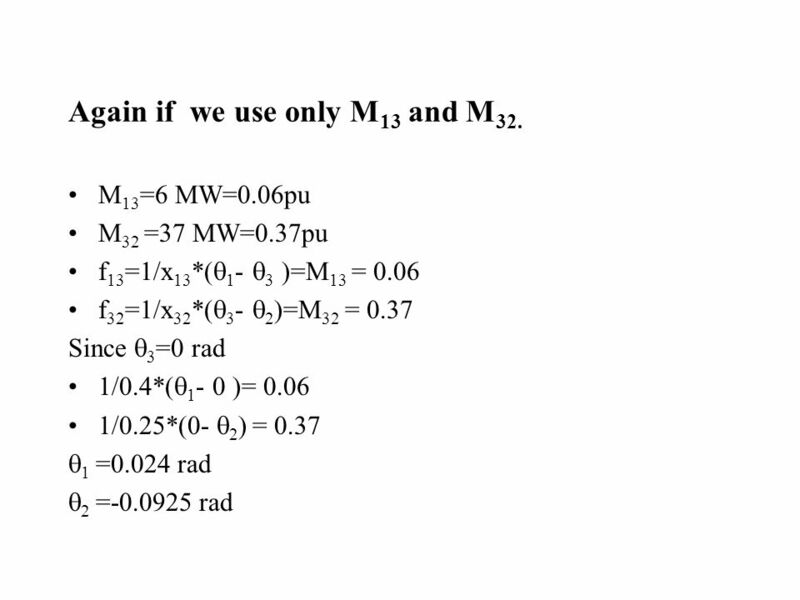 missile , airplane, or space vechicle) and the estimation of its trajectory given redundant and imperfect measurements of its position and velocity vector. In many applications, these measurements are based on optical observations and/or radar signals that may be contaminated with noise and may contain system measurement errors. 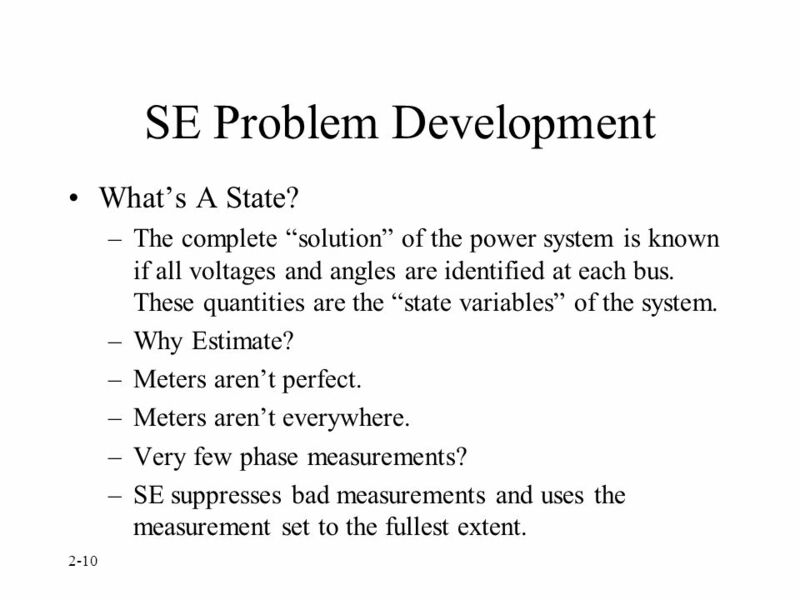 The state estimators came to be of interest to power engineers in1960s. Since then , state estimators have been installed on a regular basis in a new energy control centers and have proved quite useful. 15 State Estimation In the Power System, The State Variables are the voltage Magnitudes and Relative Phase Angles at the System Nodes. The inputs to an estimator are imperfect power system measurements of voltage magnitude and power, VAR, or ampere flow quantities. 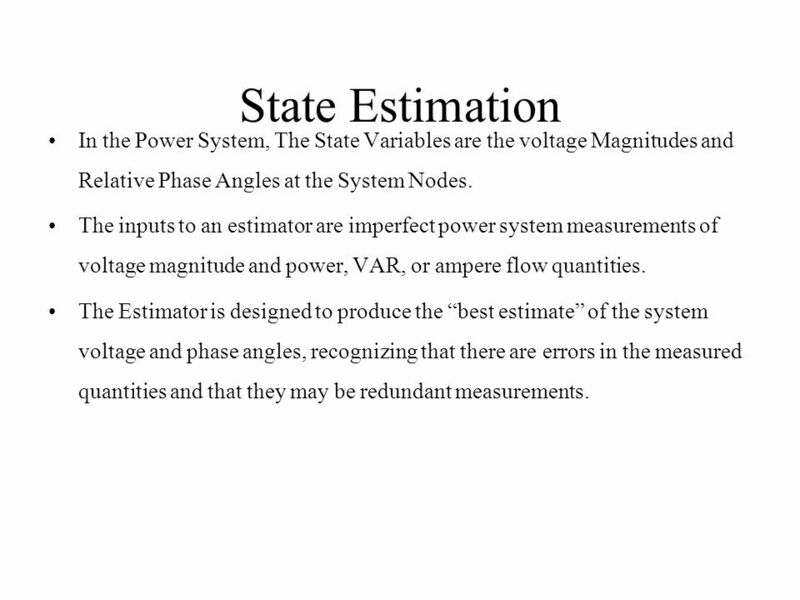 The Estimator is designed to produce the “best estimate” of the system voltage and phase angles, recognizing that there are errors in the measured quantities and that they may be redundant measurements. The solution to the basic network problem posed to find the voltages, flow, etc. 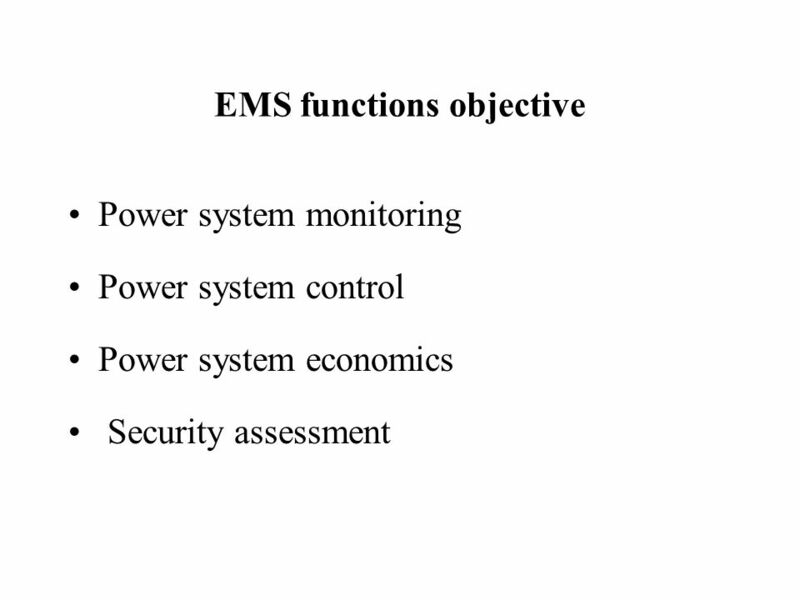 of a specific power system configuration with a specified set of operating conditions. The starting point for other applications dealing with system disturbances and system optimization. 20 Case2-result of system flow. 21 Again if we use only M13 and M32. 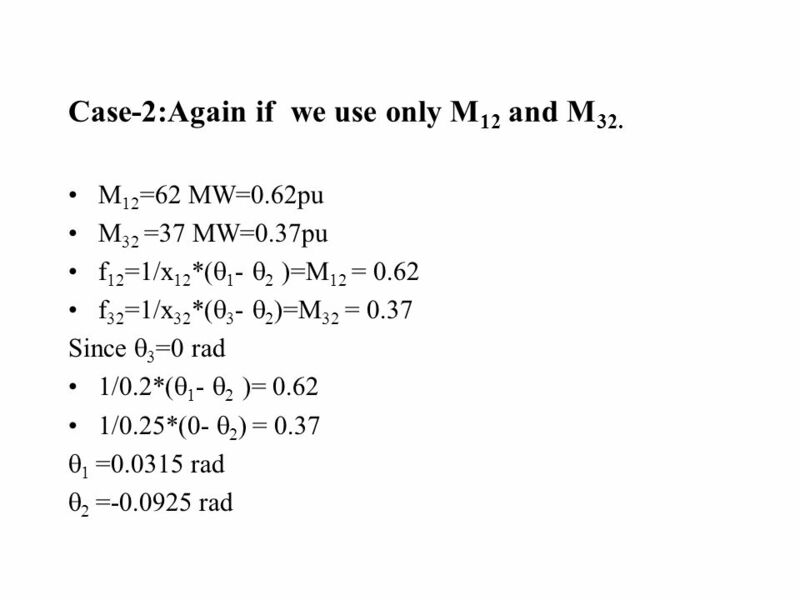 22 Case-2:Again if we use only M12 and M32. 23 What we need ? A procedure that uses the information available from all the three meters to produce the best estimate of the actual angles, line flows, and bus load and generation. 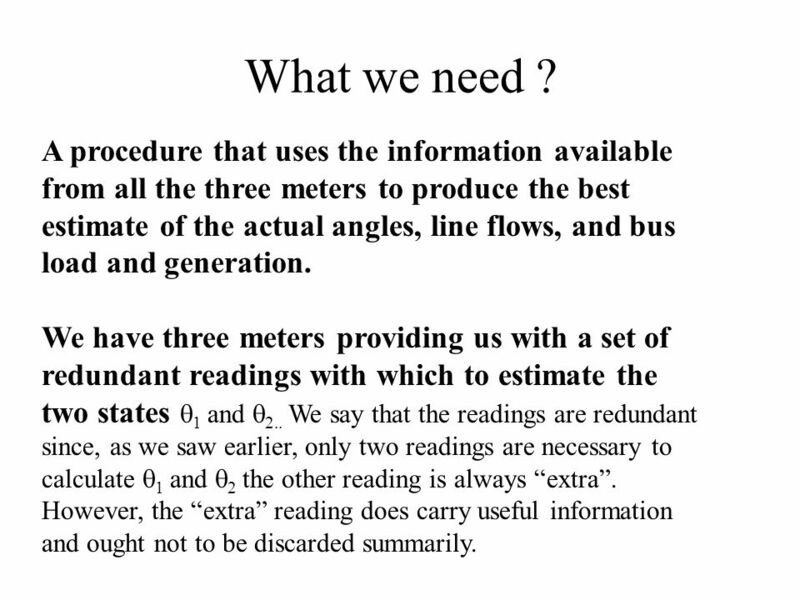 We have three meters providing us with a set of redundant readings with which to estimate the two states 1 and 2.. We say that the readings are redundant since, as we saw earlier, only two readings are necessary to calculate 1 and 2 the other reading is always “extra”. However, the “extra” reading does carry useful information and ought not to be discarded summarily. 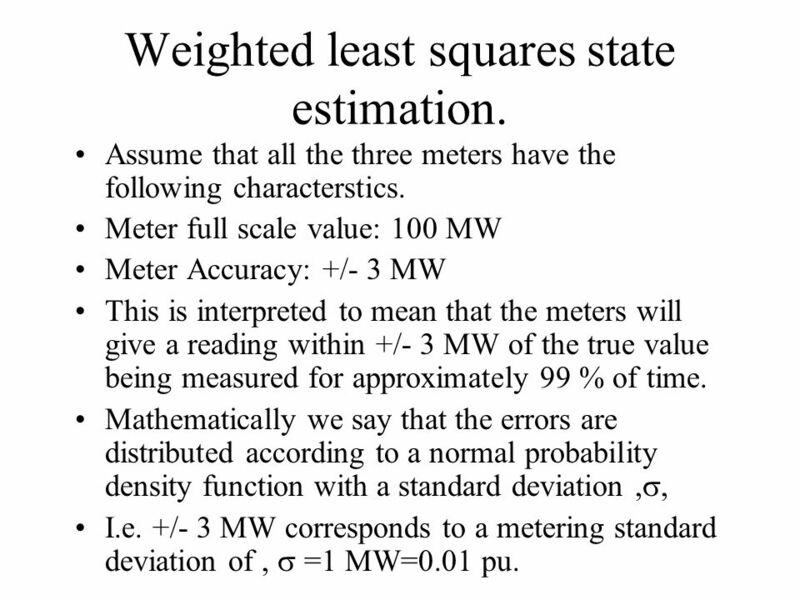 26 Weighted least squares state estimation. Assume that all the three meters have the following characterstics. 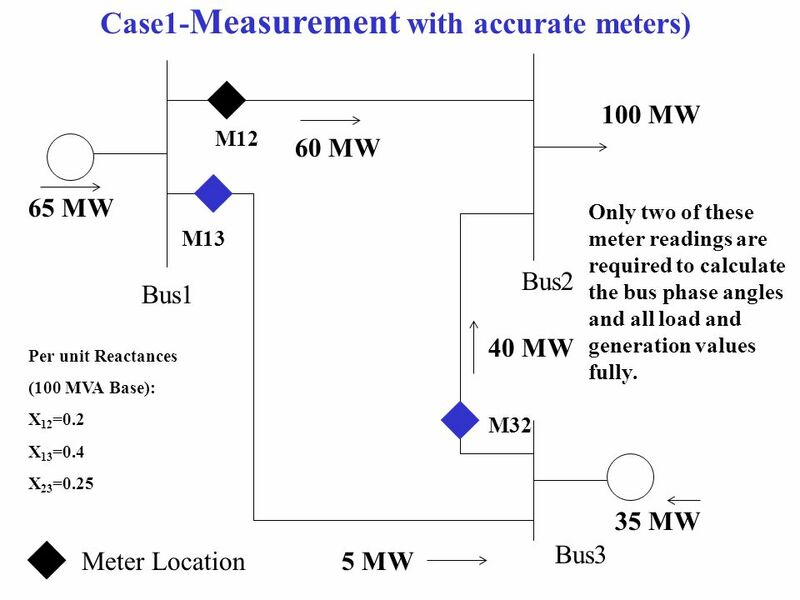 Meter full scale value: 100 MW Meter Accuracy: +/- 3 MW This is interpreted to mean that the meters will give a reading within +/- 3 MW of the true value being measured for approximately 99 % of time. Mathematically we say that the errors are distributed according to a normal probability density function with a standard deviation ,, I.e. 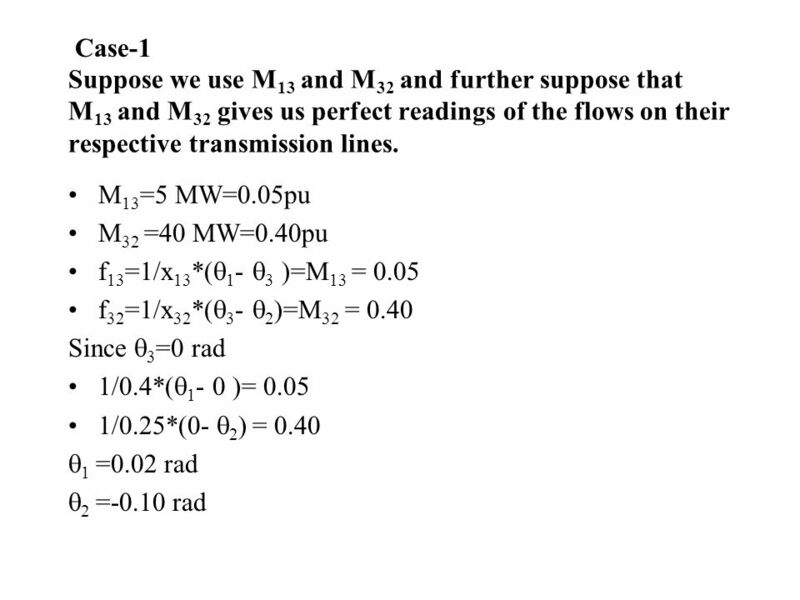 +/- 3 MW corresponds to a metering standard deviation of ,  =1 MW=0.01 pu. 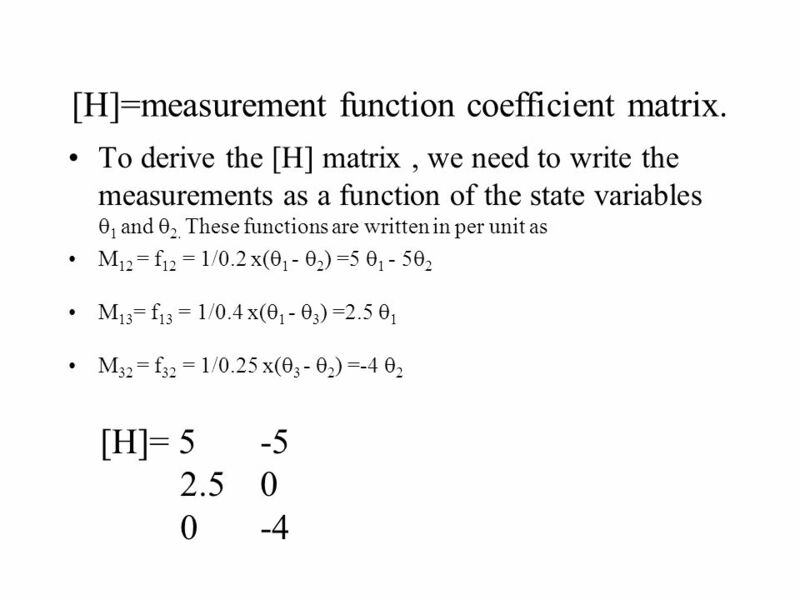 28 [H]=measurement function coefficient matrix. 30 SE Functionality So What’s It Do? 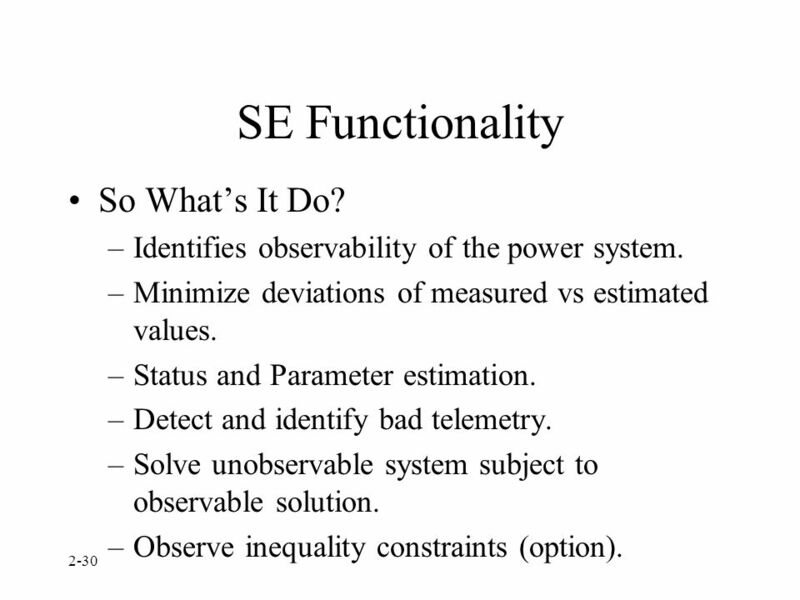 Identifies observability of the power system. 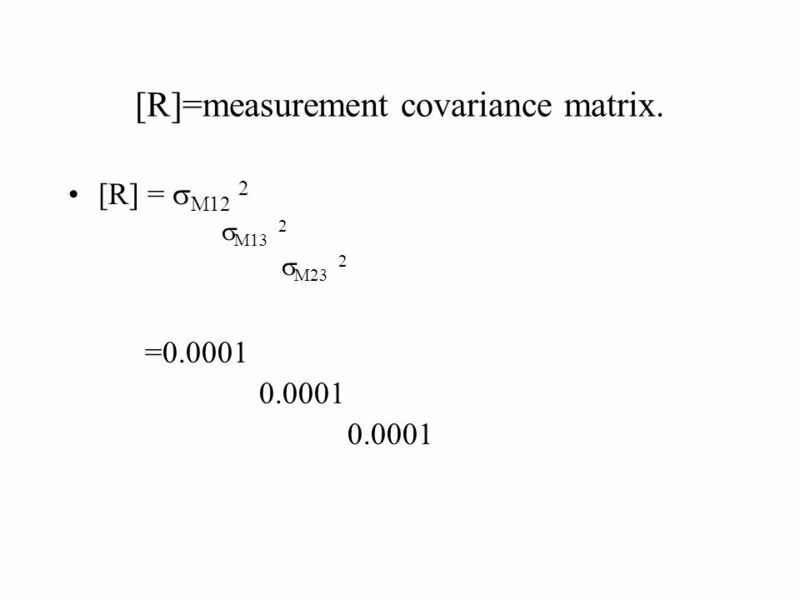 Minimize deviations of measured vs estimated values. Status and Parameter estimation. Detect and identify bad telemetry. Solve unobservable system subject to observable solution. Observe inequality constraints (option). 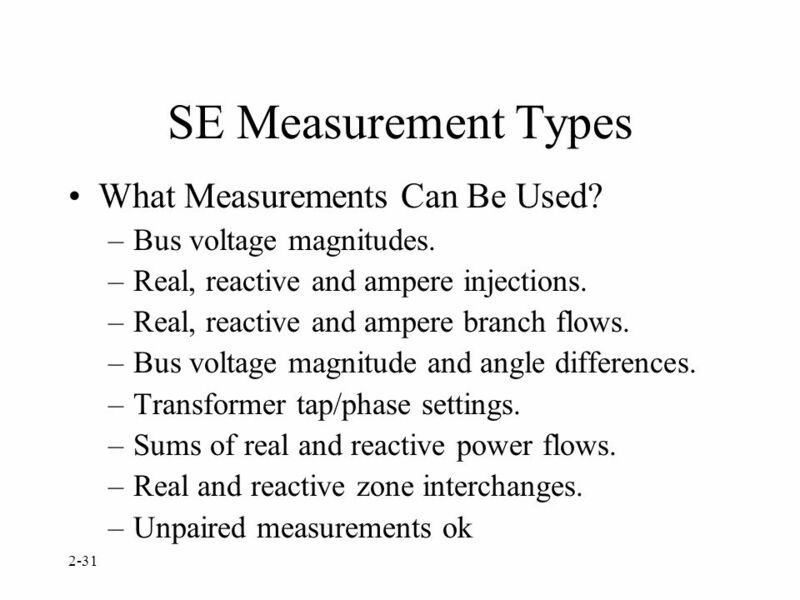 31 SE Measurement Types What Measurements Can Be Used? 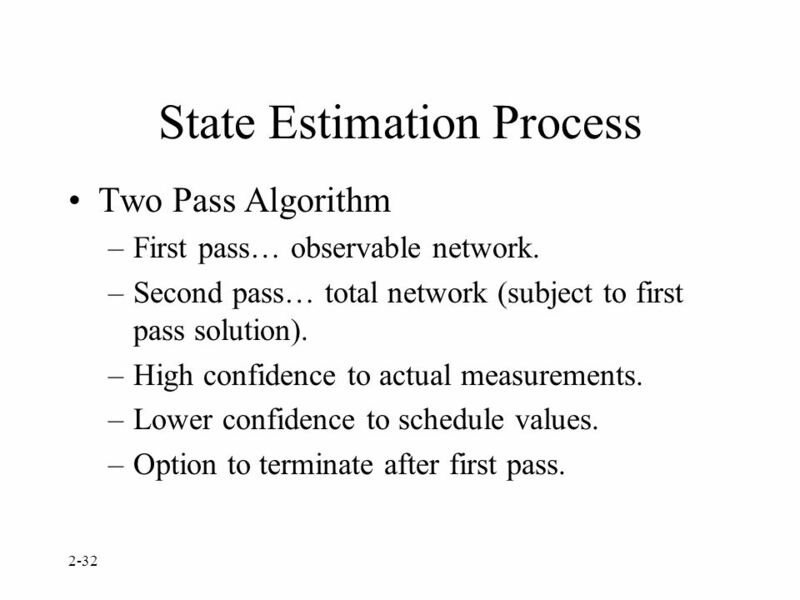 Two Pass Algorithm First pass… observable network. Second pass… total network (subject to first pass solution). High confidence to actual measurements. Lower confidence to schedule values. Option to terminate after first pass. 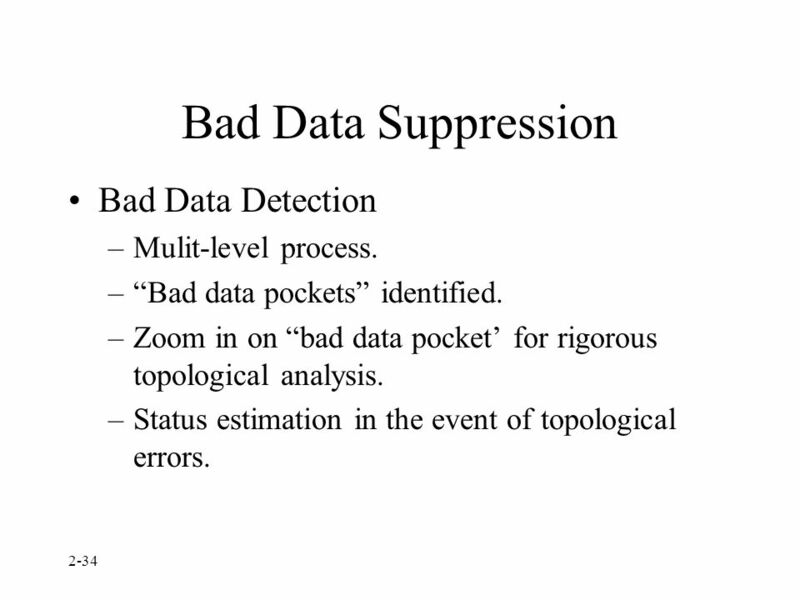 34 Bad Data Suppression Bad Data Detection Mulit-level process. “Bad data pockets” identified. Zoom in on “bad data pocket’ for rigorous topological analysis. 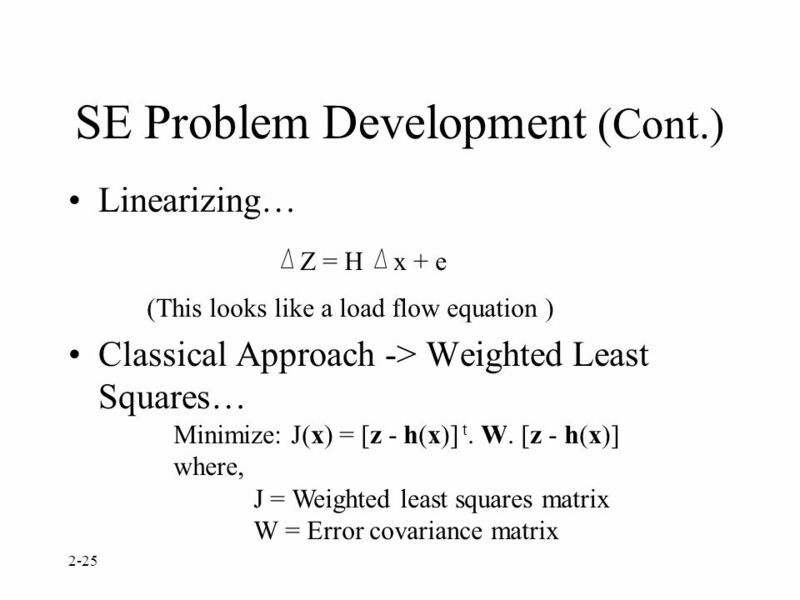 Status estimation in the event of topological errors. Used… The measurement was found to be “good” and was used in determining the final SE solution. Not Used… Not enough information was available to use this information in the SE solution. 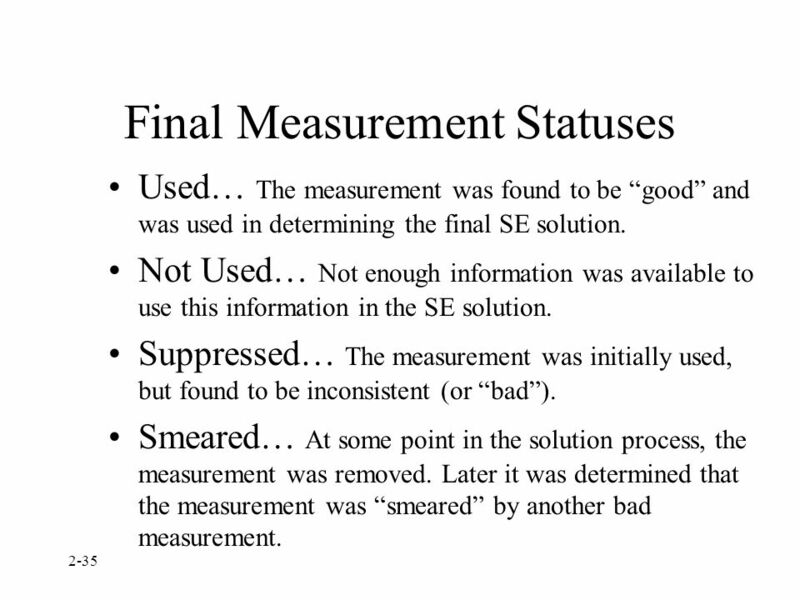 Suppressed… The measurement was initially used, but found to be inconsistent (or “bad”). Smeared… At some point in the solution process, the measurement was removed. Later it was determined that the measurement was “smeared” by another bad measurement. Given’s Rotation (Orthogonalization) Least tendency for numerical ill-conditioning. 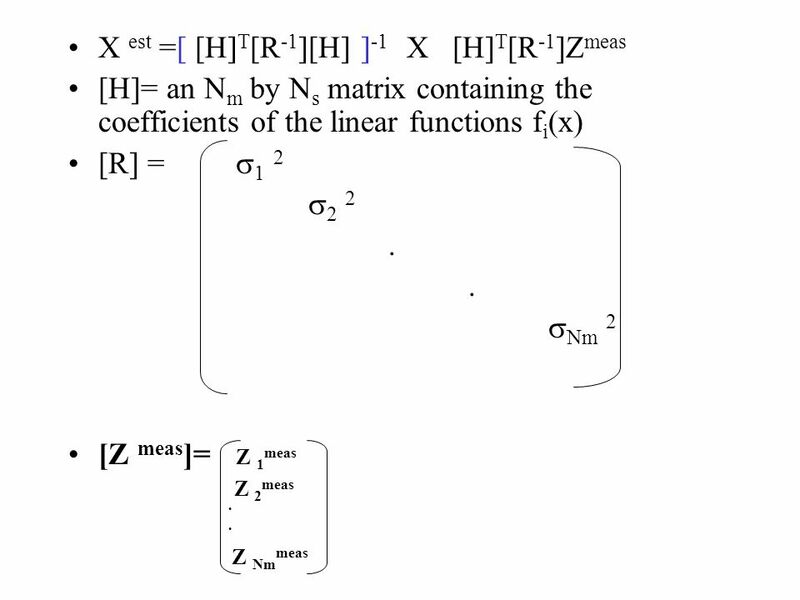 Uses orthogonal transformation methods to minimize the classical least squares equation. Higher computational effort. Stable and reliable. 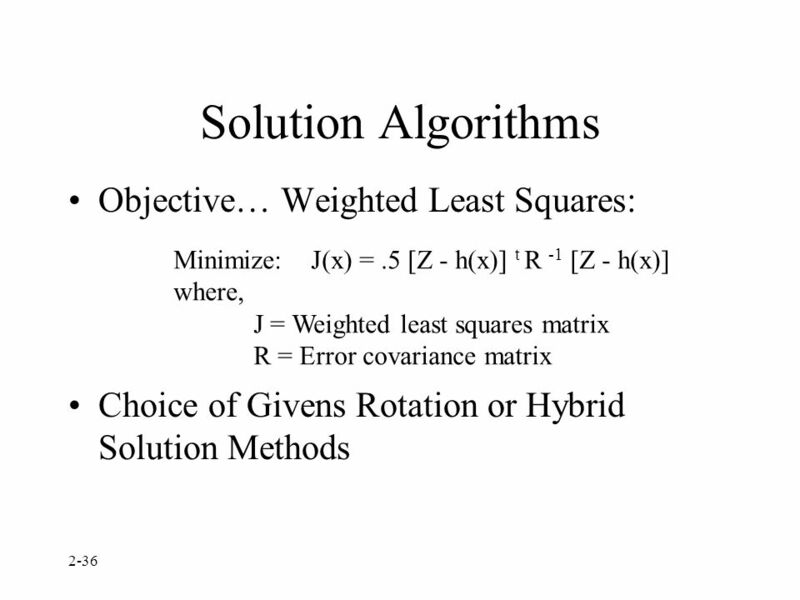 Hybrid Approach Mixture of Normal Equations and Orthogonalization. 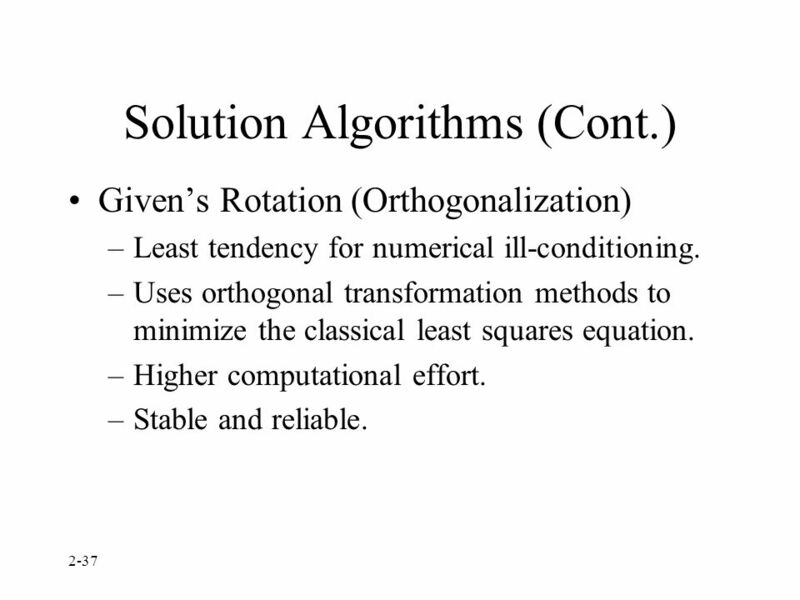 Orthogonalization uses a fast Given’s rotation for numerical robustness. 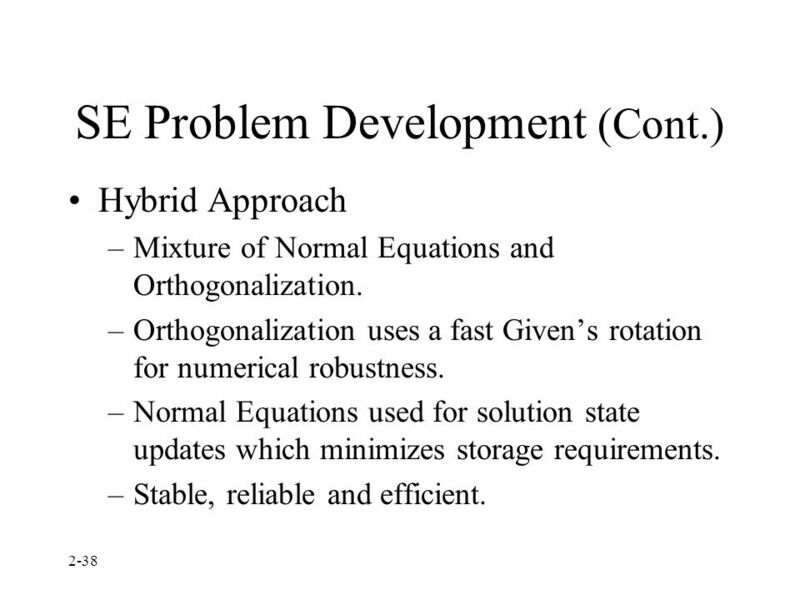 Normal Equations used for solution state updates which minimizes storage requirements. Stable, reliable and efficient. 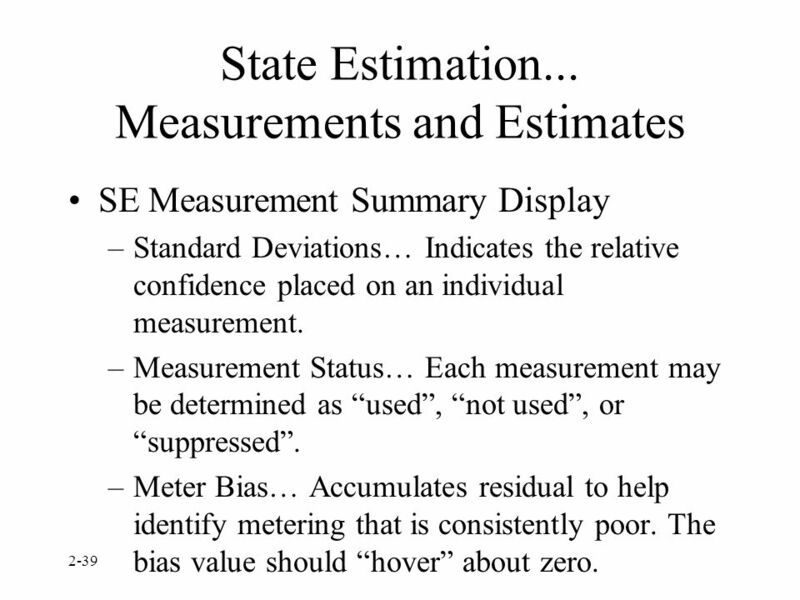 SE Measurement Summary Display Standard Deviations… Indicates the relative confidence placed on an individual measurement. Measurement Status… Each measurement may be determined as “used”, “not used”, or “suppressed”. Meter Bias… Accumulates residual to help identify metering that is consistently poor. The bias value should “hover” about zero. 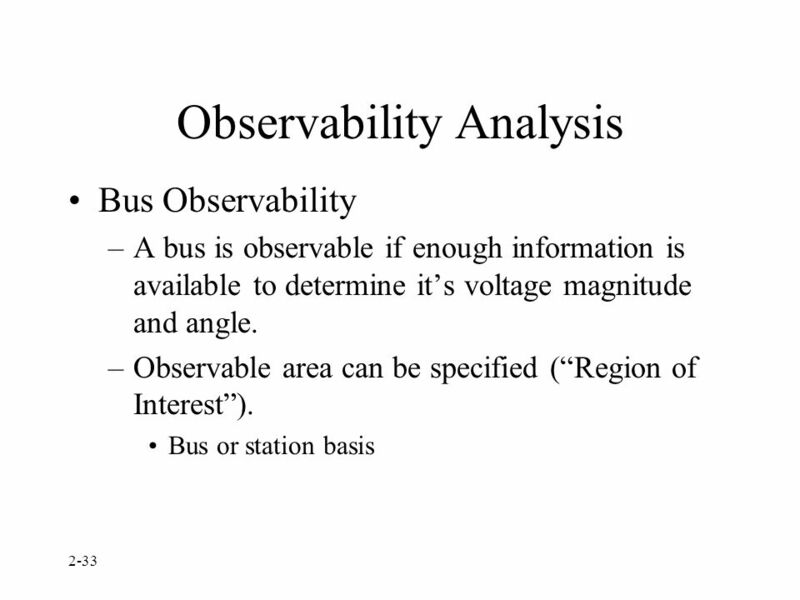 Observable System Portions of the system that can be completely solved based on real-time telemetry are called “observable”. Observable buses and devices are not color-coded (white). 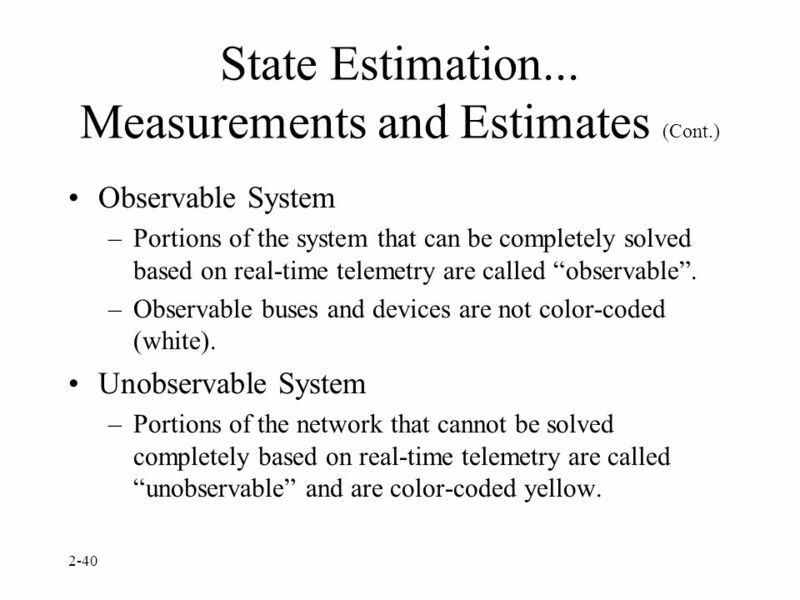 Unobservable System Portions of the network that cannot be solved completely based on real-time telemetry are called “unobservable” and are color-coded yellow. Calculated on successful completion of RTNA. Available for use by Generation Dispatch and Control. Penalty Factor display. 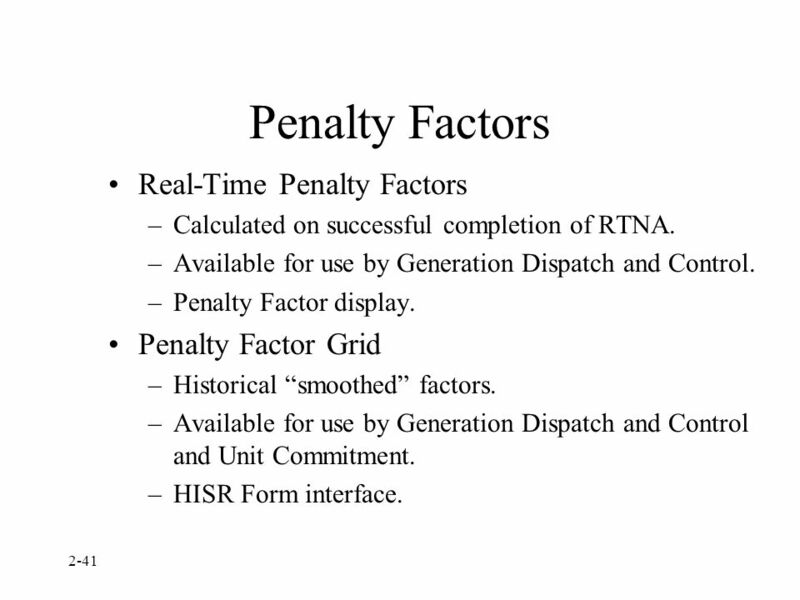 Penalty Factor Grid Historical “smoothed” factors. Available for use by Generation Dispatch and Control and Unit Commitment. HISR Form interface. 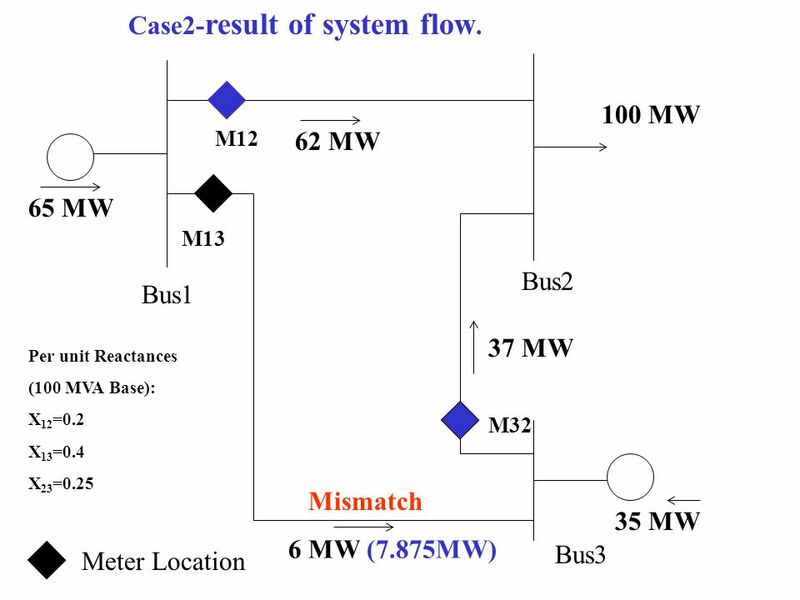 Topology/Model error in the vicinity of the problem Switching devices in wrong status, particularly non telemetered. 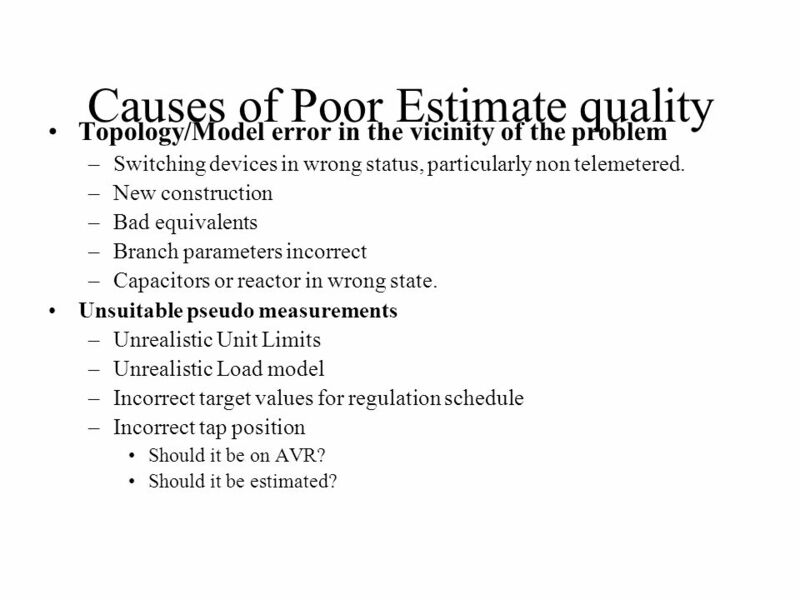 New construction Bad equivalents Branch parameters incorrect Capacitors or reactor in wrong state. Unsuitable pseudo measurements Unrealistic Unit Limits Unrealistic Load model Incorrect target values for regulation schedule Incorrect tap position Should it be on AVR? Should it be estimated? 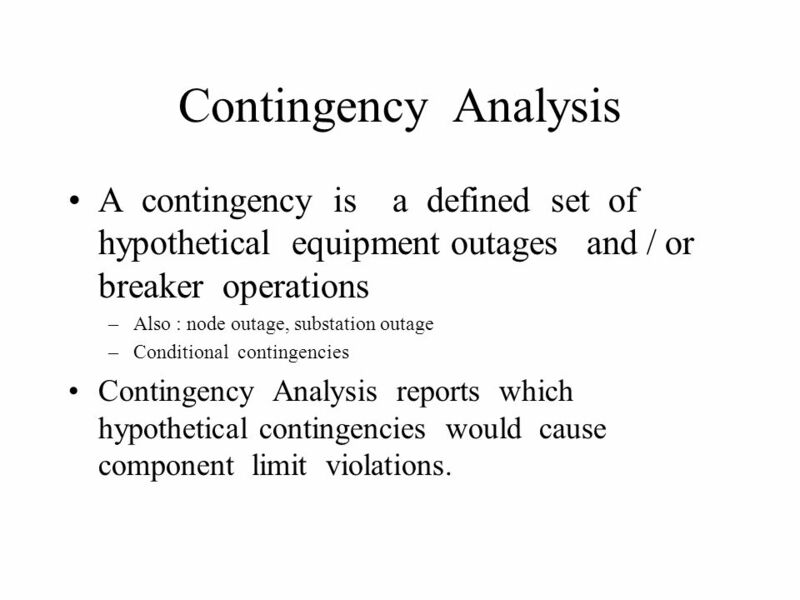 44 Contingency Analysis A contingency is a defined set of hypothetical equipment outages and / or breaker operations Also : node outage, substation outage Conditional contingencies Contingency Analysis reports which hypothetical contingencies would cause component limit violations. 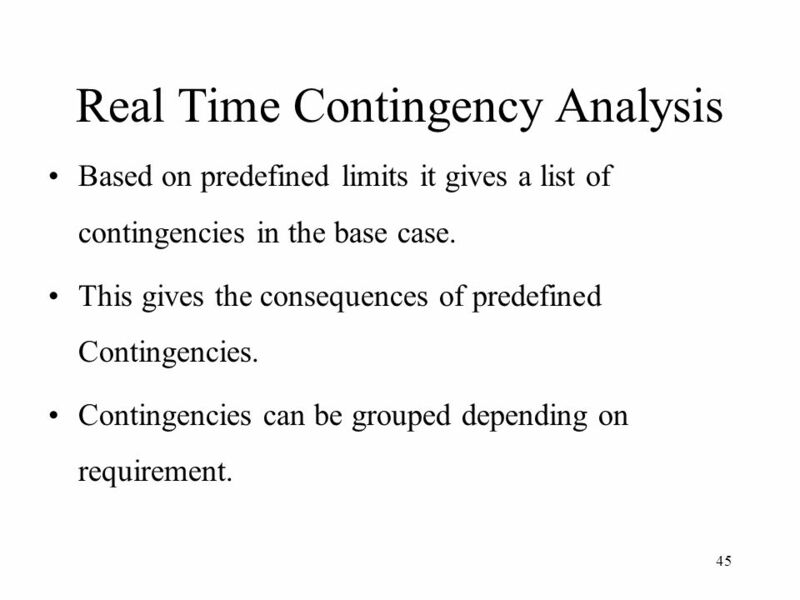 Based on predefined limits it gives a list of contingencies in the base case. This gives the consequences of predefined Contingencies. Contingencies can be grouped depending on requirement. 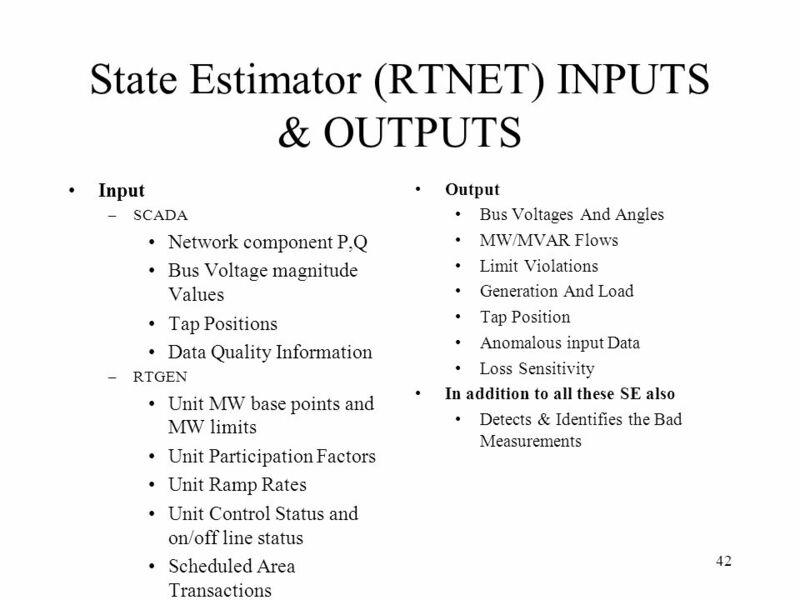 A good Base Case based on the State Estimator Output. 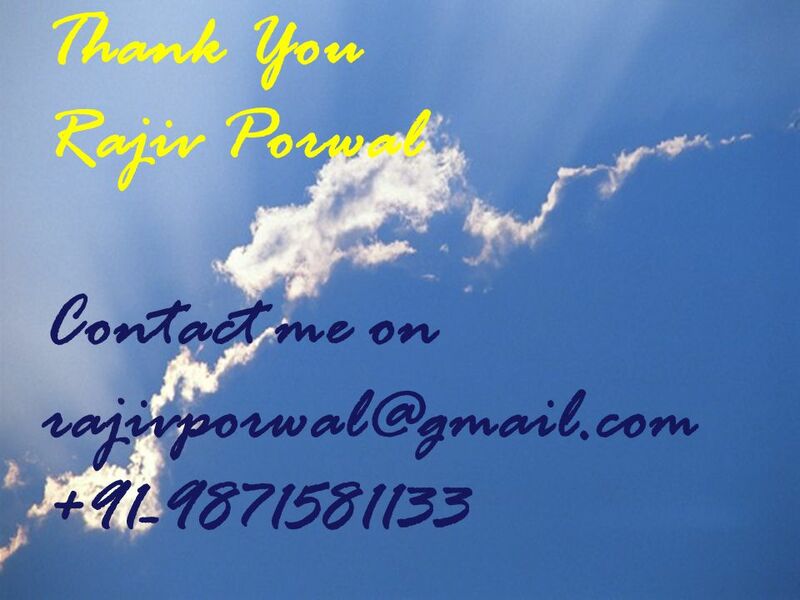 Defined all the possible credible contingencies. Correct limits for all power system elements. Download ppt "State Estimation Techniques"
Summary of Second Draft of the NERC Standard PRC Disturbance Monitoring and Reporting JSIS Meeting August 10, 2010 Salt Lake City, UT. Liberalization and deregulation of the markets power systems must be competitive, high profitable and efficient Steady increase of power demand but often.